Bolivia has accused European countries of an "act of aggression" for refusing to allow its presidential jet into their airspace, amid suggestions US fugitive Edward Snowden was on board. Bolivia said France, Portugal, Spain and Italy had blocked the plane from flying over their territory. 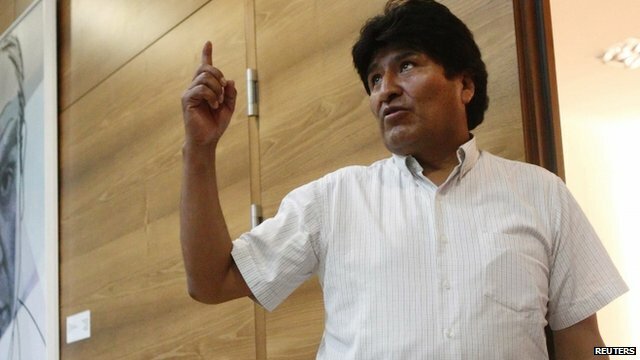 President Evo Morales was flying back to Bolivia from Moscow when the plane was diverted to Vienna. The jet was reportedly searched for Mr Snowden, wanted for leaking US secrets. He was apparently not on board and is still believed to be in Moscow's Sheremetyevo airport, from where he is seeking asylum in Bolivia and several other countries. Bolivia's UN envoy Sacha Llorenti told reporters in Geneva that he would complain to the UN about the European countries' actions. "The decisions of these countries violated international law. We are already making procedures to denounce this to the UN secretary general," he said. But France denied refusing the plane permission, and Spain subsequently said its airspace was open to the jet. And a further row broke out about whether the plane had been searched. Austrian officials said the airport authorities had searched the plane, but Mr Llorenti and other Bolivian officials denied there was any search. The plane took off from Vienna on Wednesday morning. Mr Morales said presidents should have the right to travel anywhere in the world. "It's not an offence against the president, it is an offence against the country, against the whole of the Latin American region," he said before taking off. He described the incident as "almost a kidnapping of 13 hours".